Vermont is renowned for its vibrant fall foliage, skiing, and its delicious maple syrup, but the state also offers a host of excellent resorts that make for the perfect home base. Accommodation options range from secluded lodges tucked away in the forest to luxurious spa resorts located only minutes away from the excitement of the state's bustling ski resorts. The perfect spot for anyone looking for a rustic but luxurious vacation, Twin Farms is set on a secluded 300-acre property right next to Silver Lake. The rooms can be found inside a farmhouse that dates back to the late 1700s; all are decorated with unique antiques and pieces of artwork, and most offer fireplaces, clawfoot tubs, and large windows offering gorgeous views of the estate. There are also ten private cabins with screened porches for anyone looking for more privacy. The resort also offers delicious farm-to-table food that can be enjoyed in the lodge dining room or anywhere else on the property. Formerly the private residence of a local doctor and his wife, the Inn at Shelburne Farms is an elegant, historic inn set on a gorgeous 1,400-acre property. The rooms are all uniquely furnished and decorated, and all offer beautiful views of the lake or the property's pastures and forests. Cottages and houses are also available. Proceeds from the inn go to support the Shelburne Farms educational programs, which were established to educate young people about the importance of creating a sustainable future. The inn and the restaurant are only open between May and October, but the property's welcome center and walking trails are open year-round. Set on a beautiful 120-acre property in the heart of the Green Mountains, Topnotch Resort is a luxurious resort and spa that offers plenty of outdoor activities for visitors no matter what the time of year. There are also plenty of different accommodation options to choose from, including lodge-style rooms, suites with private balconies, and entire houses. Complimentary tea service is offered each afternoon, and room service is available 24/7. Guests can also enjoy their meals at the two on-site restaurants; one is a cozy pub with a fireplace, and the other specializes in organic cuisine made with local ingredients. Known for its friendly staff and its excellent service, Woodstock Inn & Resort is conveniently located less than five miles away from the Suicide Six Ski Area. A complimentary shuttle service is offered to and from the ski area, but there's plenty of things for guests to do without leaving the resort; highlights include a spa that offers special seasonal treatments, a golf course with a clubhouse restaurant, indoor and outdoor pools, and tennis courts. The elegant rooms are decorated with wooden furnishings and marble bathrooms, and some come with additional features like fireplaces and private patios. 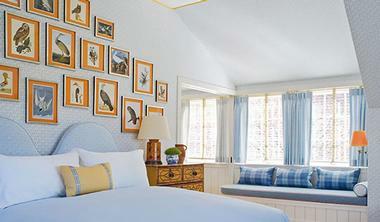 Sitting on a 15-acre property covered with trees, Rabbit Hill Inn is an intimate bed and breakfast with nineteen rooms. The rooms were designed with relaxation in mind; there are no TVs or telephones, but guests can enjoy in-room amenities like whirlpool tubs, fireplaces, canopy beds, and private sundecks. In-room massages can be arranged for an additional fee. A complimentary hot breakfast is served by candlelight every morning, and guests are also invited to enjoy a complimentary afternoon tea service with homemade pastries each day. Dinner is offered in the on-site restaurant most evenings, and reservations are required. Catering to guests who have a love of good food, the Essex, Vermont's Culinary Resort & Spa is a unique resort that offers private cooking classes for people of all ages and skill levels. Guests who are more interested in relaxing and enjoying their food than learning how to make it are in luck as well; the resort boasts two separate restaurants, both of which are proud to serve food prepared with organic ingredients grown on the resort property. The individually-decorated rooms are all equipped with flat screen TVs and coffeemakers, and some also feature fireplaces and whirlpool tubs. Surrounded by lush gardens, the Castle Hill Resort and Spa is an upscale establishment with an excellent location only three miles away from the Okemo Mountain Resort. Guests can choose between elegant hotel rooms and spacious condos; all come with free Wi-Fi and flat screen TVs, and the condos feature gourmet kitchens. All guests are also welcome to use the many hotel amenities, which include tennis courts, a well-equipped fitness center, an award-winning spa, a heated outdoor pool, and a cozy library with a fireplace. There is also an upscale restaurant that specializes in French cuisine. 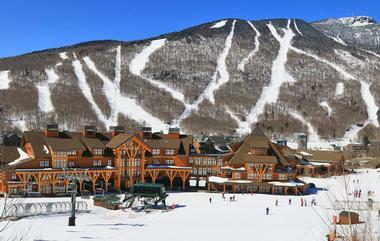 Perfect for ski and snowboard enthusiasts, the Stoweflake Mountain Resort & Spa is located in downtown Stowe, only four miles away from the Stowe Mountain Resort. The spacious rooms come with complimentary Wi-Fi and upscale toiletries; some also offer additional features like fireplaces, private balconies, and whirlpool tubs. Another highlight of the resort is the luxurious spa, which offers a full range of treatments as well as a meditation garden and a unique massaging waterfall. Other resort amenities include a 9-hole golf course, indoor and outdoor swimming pools, tennis courts, and a restaurant with seasonal outdoor dining. 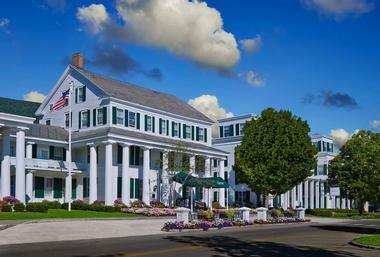 As you might guess from the name, the Mountain Top Inn & Resort is perched on top of a mountain in Central Vermont. In addition to stunning views of the mountains that surround resort, the property offers a large lake with a private beach. Accommodation options include lodge-style rooms, cozy cabins, and private guest houses; all are individually decorated, and some come with features like fireplaces, whirlpool tubs, or kitchenettes. The resort also offers a wealth of fun activities both on and off the property, including yoga classes, stand up paddle board lessons, sleigh rides, and cross-country skiing. 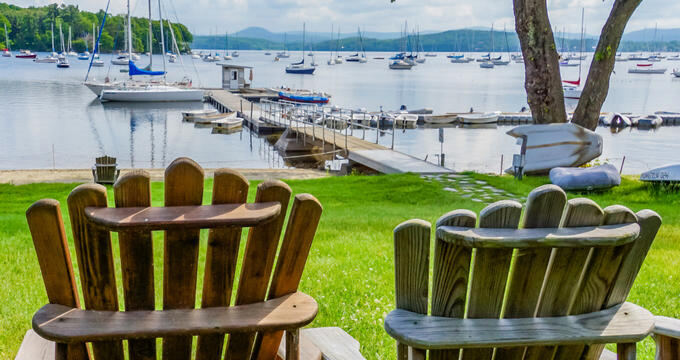 Located right next to the Basin Harbor Club Golf Course, the Basin Harbor Resort & Boat Club overlooks Basin Harbor on Lake Champlain. The charming, individually-decorated rooms are spread out across four buildings, and there are also more than 70 private cottages scattered across the property. The on-site restaurant boasts floor-to-ceiling windows with beautiful views of the lake, and guests can choose to book accommodation and meal packages if desired. 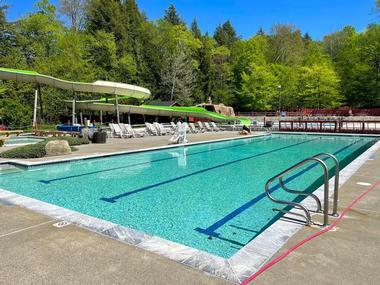 The resort also offers plenty of recreational opportunities for guests, including tennis court, paddleboats, and lawn games, and anyone who would like to golf is welcome to do so next door. Sitting at the base of Stowe Mountain, the Stowe Mountain Lodge boasts stunning views of the Green Mountains and easy access to the ski lifts of Mount Mansfield and Spruce Peak. An on-site ski and snowboard valet makes the lodge uniquely suited to anyone interested in spending most of their time on the slopes, but there are plenty of reasons for non-skiers to stay here as well. The comfortable rooms come with marble bathrooms, flat screen TVs, and feather beds, and communal amenities include a heated outdoor pool, a spa offering treatments inspired by local indigenous traditions, and two on-site restaurants. Boasting breathtaking views of the surrounding Green Mountains, the Kimpton Taconic Hotel is a boutique hotel tucked away on a tree-lined street in the historic Manchester Village. The sophisticated earth-toned rooms come with flat screen TVs, high-end linens, wireless speakers, and yoga mats; other accommodation options include suites and cozy, secluded cottages. In-room massages and spa treatments can be arranged, and the hotel fitness center is conveniently open 24/7. Guests are welcome to enjoy a drink or a meal at the on-site bar and restaurant, and complimentary coffee and tea are available every morning. 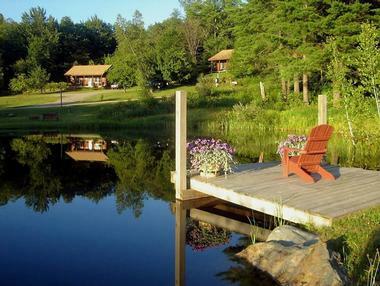 Consisting of 24 log cabins spread out across a beautiful 360-acre property, the Sterling Ridge Log Cabin Resort is a rustic three-star resort with breathtaking views of the nearby Mount Mansfield. The country-style cabins range in size from one to three bedrooms, and they all come with full kitchens, covered porches, separate living areas, and picnic tables for guests who prefer to dine outside. Plenty of hiking and cross-country trails can be found close to the resort, and canoe and kayak tours are offered for a fee. Dogs are welcome at the resort, and special dog amenity baskets are given to pets and their owners. Set on a spacious 2,500-acre property that offers an endless array of outdoor activities, the Trapp Family Lodge is a European-style mountain resort established by the famous von Trapp family. The rooms, suites, and guesthouses are inspired by traditional Austrian mountain resorts, and they're furnished with comfortable amenities like whirlpool tubs, fireplaces, and balconies with views of the surrounding mountains. There are also plenty of on-site food and beverage options for guests to choose from, including two restaurants, a bakery, a state-of-the-art brewery, and a wine cellar. Other amenities include a hot tub, indoor and outdoor heated pools and tennis courts. Spread out over two distinct mountains, the Stowe Mountain Resort is exactly what most people imagine when they think of the perfect Vermont ski resort. Open year-round, the resort offers the opportunity to enjoy all sorts of outdoor activities, including skiing, snowboarding, hiking, and downhill mountain biking. There are also lodging options to suit almost every taste and budget; visitors can choose to stay in cozy hotel rooms, rustic country-style inns, or luxurious condos with direct access to the mountain's ski lifts. Guided tours of the mountain are offered every Friday, Saturday, and Sunday morning. 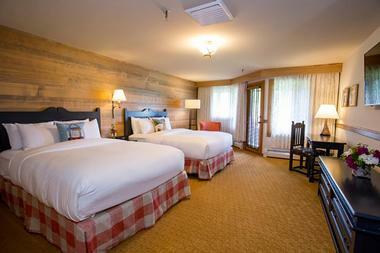 True to its name, the 506 On The River Inn features an excellent location right on the banks of the Ottauquechee River. The charming New England-style rooms all offer views of either the river or the property's beautiful gardens, and they also include complimentary Wi-Fi, flat screen TVs, and small kitchenettes with coffee makers and mini fridges. A complimentary breakfast is included in the room rate, and free coffee, tea, and cookies are provided for guests to enjoy all day long. Other amenities include a children's play room, an indoor pool with a sauna, a game room, and a bistro. 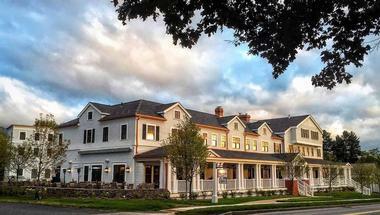 Nestled in the Mad River Valley, the Pitcher Inn is a luxurious boutique hotel with eleven intimate, individually-decorated rooms and suites for guests to choose from. 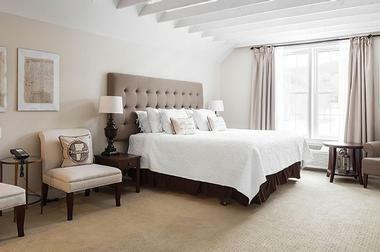 The rooms are equipped with amenities like wood-burning fireplaces, high-end European linens, and jetted bathtubs, and many also have private balconies. On-site amenities include a games room, a library, and an excellent restaurant; guests are also given complimentary access to a nearby health club, which offers tennis courts, indoor and outdoor pools, and plenty of exercise machines. 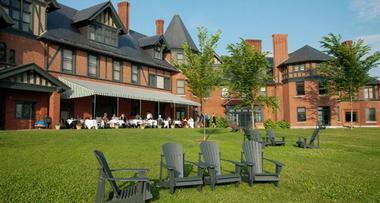 The hotel also offers complimentary use of its bicycles, yoga mats, sleds, snowshoes, and canoe. The Reluctant Panther Inn and Restaurant The twenty rooms and suites are spread throughout three different buildings, and all are decorated with antique furnishings and unique artwork. Other in-room amenities include fireplaces, flat screen TVs, and marble bathrooms. A complimentary hot breakfast is served each morning, and guests are welcome to enjoy their other meals at the hotel restaurant, which offers an excellent selection of contemporary dishes made with locally-sourced ingredients. The hotel staff are more than happy to help guests arrange activities in the surrounding area, including horseback riding, fly-fishing, and downhill or cross-country skiing. Situated just outside the Green Mountain National Forest, Windham Hill Inn occupies a quaint 19th-century farmhouse set on a 160-acre property with several outbuildings. There are 22 rooms to choose from; many are in the main farmhouse, but there are also several converted barn suites as well as a private cottage with a full kitchen. Most rooms come with features like fireplaces, window seats, jetted tubs, and antique furnishings. The on-site restaurant offers tasty cuisine made with local, seasonal ingredients, and it sometimes hosts special wine evenings. 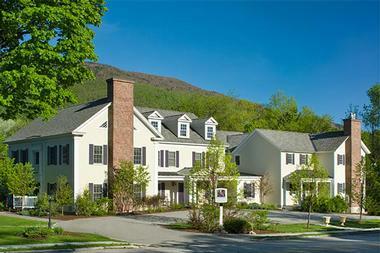 Other amenities include a heated pool, tennis courts, a chic spa, and several excellent walking trails. Housed in an elegant farmhouse, the Maple Leaf Inn is a charming bed and breakfast surrounded by more than fifteen acres of birch and maple trees. There are seven beautiful rooms to choose from; all are equipped with flat screen TVs and complimentary Wi-Fi, and some also offer features like four-poster beds, whirlpool tubs, and wood-burning fireplaces. Guests are also welcome to relax on the communal porch, which offers rocking chairs and beautiful views of the property. A three-course breakfast is served in the dining room every morning, and the inn is happy to accommodate dietary restrictions and allergies if notified in advance. Offering the perfect combination of modern amenities and elegant Victorian charm, the Governor's House In Hyde Park is a quaint bed and breakfast conveniently situated less than ten miles away from Stowe. The rooms are housed inside a mansion that was built in 1893; the interior of the building still retains much of its original woodwork, and it's decorated with period furnishings and beautiful hand-painted murals. Gas fireplaces and private bathrooms can be found in every room, and all room rates include a delicious three-course breakfast. An afternoon tea service and bedtime hot chocolate are offered to guests free of charge as well. 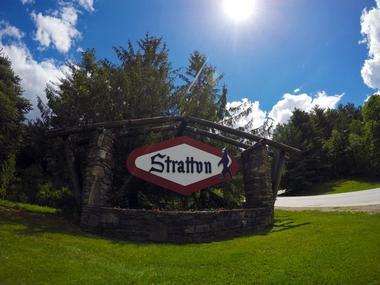 One of the best ski resorts in the state, Stratton Mountain Resort boasts more than 600 acres of excellent skiable terrain and almost 100 distinct trails. However, there are plenty of things for non-skiers to do as well; popular winter activities include skating, dog sledding, tubing, and relaxing in the on-site spa. During the winter, visitors can enjoy outdoor activities like golfing, hiking, and mountain biking. There is also an almost endless array of accommodation options for visitors to choose from, including classic lodge-style rooms, condos with up to four bedrooms, and cozy ski chalets with fireplaces. With almost 200 rooms and suites to choose from, the Mount Snow Grand Summit Resort is the only property on Mount Snow that offers direct ski-in/ski-out access to the resort's trails. The hotel-style rooms come with flat screen TVs, cozy wooden furnishings and complimentary Wi-Fi, and there are also studio and suite apartments designed to provide guests with a true home away from home; all units come with full kitchens, dining areas, and plenty of storage space. The on-site restaurant specializes in farm-to-table cuisine, and other amenities include an outdoor pool, a spa, a fitness center, and an 18-hole golf course. Resting at the base of Mt. 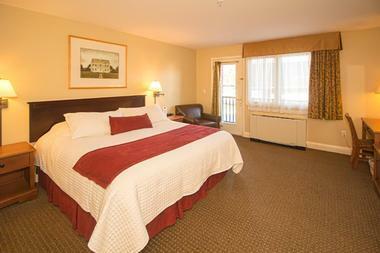 Equinox, the Inns At The Equinox is a romantic resort that was designed for relaxation. Accommodation options include country-style guest rooms with fireplaces and four poster beds, contemporary townhouses, and spacious bi-level suites, all of which offer complimentary Wi-Fi and spa-inspired toiletries. One of the biggest draws of the property is the on-site spa, which offers a relaxation room and specializes in treatments that incorporate local products, but other amenities include a heated pool where fitness classes are sometimes held, a challenging golf course, tennis courts, a steam room, and several on-site restaurants.